This is a common problem of design documentation. How to keep an account of the decisions that led to a design as it is? It is interesting to keep a trace of previous iterations, to look back at the evolution of a design. But more importantly, it is a waste of time if another designer (or your forgetful self) makes changes that recreate a problem that has already been solved, just because they have no knowledge of the history behind that decision. For all those reasons, I was looking for a practical way to link each feature to the decision path that led to it. It needed to be quick to write and to read, because if we have to go back and read multiple paragraphs of history, we all know no one will do it. Surely, someone already came up with a solution, right? How does this affect W? And here is a real example form the prototype of the dialogue system I was alluding to in the introduction. To give a bit of context, it was a test for a typing based branching dialog. Typing highlighted keywords would make the conversation go forward on the topic of the chosen keyword. 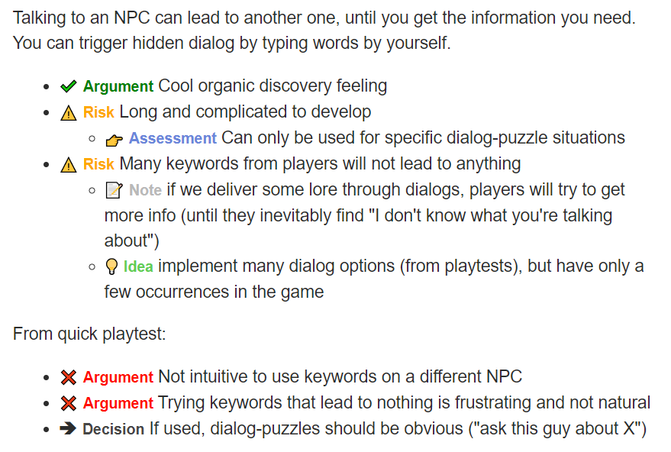 The playtest challenged the idea of having secret keywords the player could type by himself, that they would have learned from another NPC. All the icons are basic unicode emojis and not images to gain time and ensure full compatibility. The bullet point notes of each prototype where copy pasted into Slack for the whole studio, and you can now see an example in this article, without extra work. They can also all be drawn quickly, at least in broad strokes, to be used when taking notes with pen and paper. When we entered into production and decided to use a wiki as our design document, we ported the icon system to it. The wiki tool that is made to c into ⇒ was modified to also change :idea: into . Here is another example, taken from the wiki page about the consumption of “mana” to cast spells. We ended up using those icons to add quick “work in progress” notes in our design documents. The most common is the idea icon ( ), used whenever we want to add an idea to an existing page for later review. The couple problem ( ) - solution ( ) identifies problems and solutions to evaluate whenever we can take the time to redesign the feature. The intention icon (⊕) has been added later, specifically for the wiki, to justify the purpose of a feature. Game design documents are in a constant work in progress state, evolving during development. They are often out-of-date from the latest changes if you do not have someone dedicated to that (which, on our small team, we don’t). The tool and format we use to write them should support that. With our system, whenever we see a bullet point with an icon, we know that the information is still part of an ongoing discussion. Other team members can trust what is written because what is unknown or unsure is also documented. The design process is transparent in the documents. In the future, that system will evolve a bit like a new language. In one hand by adding the icons we need, and in the other hand by removing the ones that are not used to avoid cluttering. The list as it is now is probably a bit too long. Now that I have told you everything, I would love to know if that system can be useful to others, or if other solutions exist.